Twilight Struggle is a game that demonstrates more than a few moments of absolute genius although its austere aesthetic and unforgiving design can be somewhat off-putting. We gave it four stars, noting that while it is undeniably a deep and intense experience there are frustrating elements of unmanageable randomness that undermine what are otherwise elegant game systems. That was though relatively minor criticism in a review that was brimming over with positivity. If you make the effort, you’ll find a lot to love in this box. But let’s say you did make the effort – would it be playable? Let’s coup at DEFCON two and blow this whole thing wide open. We strongly recommend Twilight Struggle in this category. Good work, GMT games! Visual accessibility is a more troublesome area. The map that you get in the box is huge. Not two fold. Not four fold. Not even six fold. This is an eight fold board, and it is dense with information. Individual countries have a stability index in their top right, and if they are part of the initial influence context of play they also have the necessary starting factional influence in the bottom left. The map is well contrasted throughout, but certainly in Africa there is a visual clutter that shows country borders that will interfere with clear identification of influence channels. Each of the influence tokens shows a symbol and a number on it, and this represents the amount of influence that is currently applied in a location. It’s very easy to identify, assuming some degree of visual and colour discrimination, where a power has control – the contrast between the red and blue is very high. However, it is a lot more difficult when dealing with visual impairment to gauge the much more important presence values. A very significant portion of play revolves around swapping influence in these countries since it is more expensive to do it in a country that is already controlled. Close inspection will be required here. Tear down what wall? Who’s John Paul II? WHAT’S GOING ON? Many cards have persistent effects that hold true for the length of a turn, or until a particular event occurs. These are indicated with small tokens that are quite textually dense given how tiny they are. There are about twenty of these, along with the tokens that represent influence (which must be constantly adjusted) and the tokens to handle DEFCON, the space track, action rounds, victory points, and so on. There are a lot of tokens that interact in very subtle ways. That is dense with game information, including ongoing effects and conditional clauses that permit the card to be cancelled. More than that, the applicability of the card is influenced by the state of the world map. 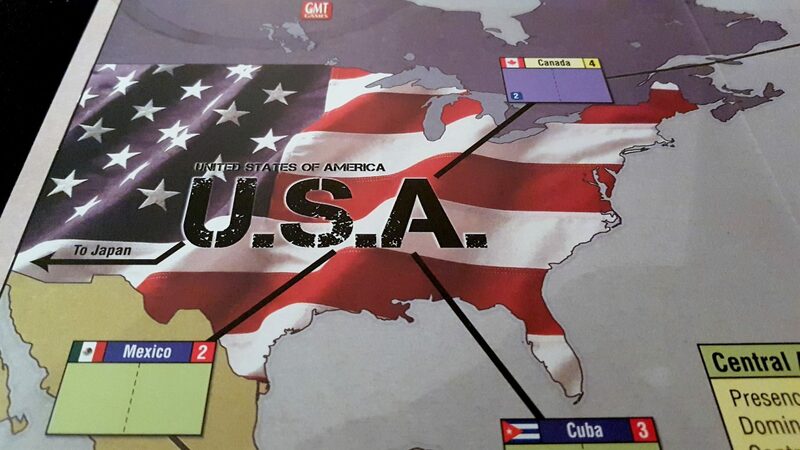 If you are the USA and you play this card when your opponent has no influence in Cuba, it’s a completely different thing to playing it when they have control. Not only is the readability of some cards an issue, but it feeds into a player’s ability to visually ascertain critical board state without revealing key information to your opponent. If you look up close at Cuba, and then look up close at West Germany and Turkey, a player that knows the decks will have a fair idea what you’re up to. This is true of many cards, where the situational influence is key to the viability of sensible play. Unlike in most games, playing an opponent with the deck (at least partially) memorised is likely to be the rule rather than the exception. As we discussed in our review, Twilight Struggle is a game that practically mandates deck memorization for effective play. This isn’t an insurmountable issue, but it is a cause of visual inaccessibility that needs to be taken into account. The influence markers form a kind of currency, but they are only differentiated by numbers. There’s no tactile differentiation between high and low denominations, or US versus USSR influence. The game makes use of two dice, but they’re standard d6s – accessible variants could be used without difficulty. They come in two colours, but these are entirely thematic choices and you have no need to match them. The sprawl of information across the board, the tightly bound card and board-state effects, and the often dense text associated with cards mean that we can’t recommend Twilight Struggle in this category. If you want to make the effort though, you will almost certainly find a compensation strategy. For example, each of the cards has an identifying number and the manual comes with a full card reference. External sites give large electronic versions of the cards that are more easily interrogated with accessibility aids, but with the obvious impact on game flow and intentional signalling. 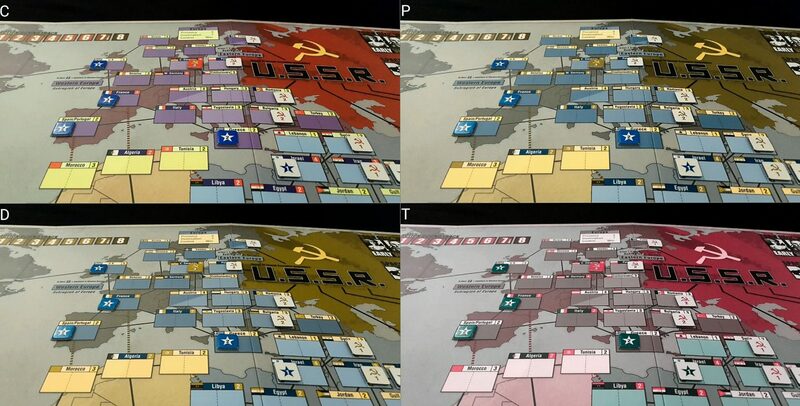 If cognitive accessibility is at all an issue, we’d strongly recommend you avoid Twilight Struggle. Everything about its design creates cognitive tension – this is obviously intentional, and is in large part the key entertainment payload that comes from play. However, it stresses every cognitive faculty pretty much constantly across a very long, three hour game session. First of all, it requires a very high degree of literacy, along with a lower (but still substantial) degree of numeracy. That numeracy has to extend not only to arithmetic expressions (such as d6 + op value versus 2X stability) but also probability. This is a game where probability charts are available to aid in assessing success or failure of particular actions. The arithmetic numeracy is not especially high, but the implied numeracy of assessing odds, risk and probability are considerable. The value of individual countries is hugely contextual and must be assessed within a geopolitical context. Scoring value may be something to deprioritise in exchange for positional dominance, or to be sacrificed once a scoring card has been played until the next one comes into the deck. There is no way to say ‘This is what you should be doing’ because it’s all based on what cards have been played, which remain to be played, the cards you have in your hand, and the cards you believe your opponent has. Similarly, much of the real skill in the game comes not from controlling territories as such, but controlling the momentum which allows you to control territories. That requires a kind of mental Judo, knowing when to take advantage of an opponent’s over-reach and when to seize the initiative. The game requires, for effective play, a working knowledge of each of the three decks. Certain plays are simply a bad idea in various stages of the cold war because of the way event decks will undermine effort. There’s no point in the USSR attempting to take Japan until the US/Japan Mutual Defence Pact card is out of the deck. Likewise, France is a bad investment for the USA while the De Gaulle card is lurking out there. When certain events are played, they hugely alter the landscape of risk and reward across the entire game. That asks a lot of working and long term memory, and the reassessment of feasible strategies puts a lot of burden on fluid intelligence. While the game rules don’t synergise especially strongly, the card events do interact in subtle ways. 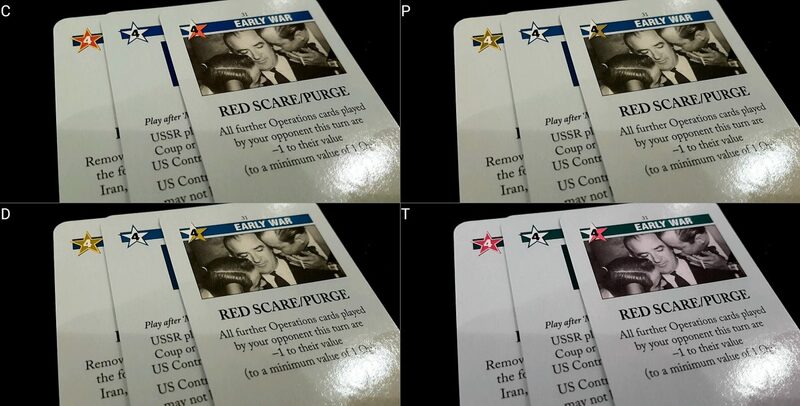 For example, playing The Red Scare as a headline card reduces future op values of your opponent by one, which hugely impacts on the value of the Space Race card when it comes to attempting to advance the space track. Some cards require the discarding of a card with a particular operations value, which is impacted by this ongoing effect. Each card can subtly, and not so subtly, influence the value of each other. There are few traditional synergies, but many complex interrelationships that are further moderated by ongoing effects played in earlier phases. The exact outcome is only rarely precisely coupled to the initiating action, and the rules for a DEFCON loss mean that even simple mistakes can cost someone the game. Scoring requires a fair degree of foresight and planning, and the ability to meaningfully execute on a strategy within tight constraints whilst still keeping an opponent contained. 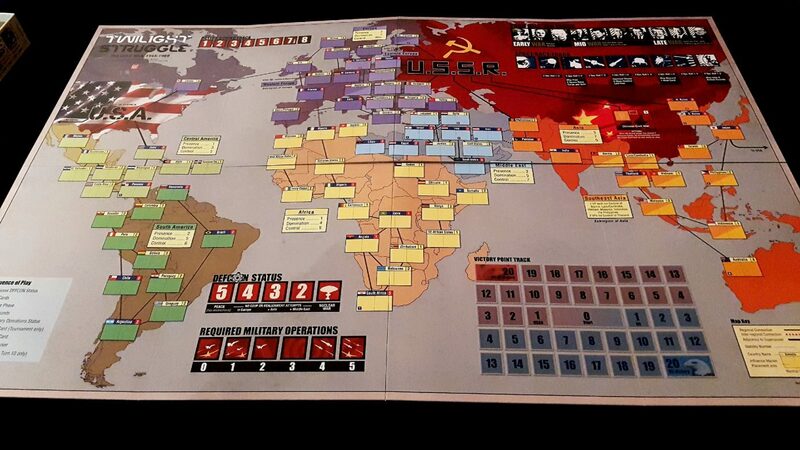 There is a constant optimisation puzzle at the heart of Twilight Struggle. While you do not need a formal understanding of the Cold War to play, it helps to understand the basic shape of the conflict and how it progressed. The momentum of each side varies as the card events trigger, and over time the early game dominance of the USSR will give way to the beefed up power of the USA. Part of responding to the game and understanding the broader significance and impact of your cards is an appreciation of the historical context. As I say, it’s not necessary but it helps. Yeah. Keep away from Twilight Struggle if you’re looking for a cognitively accessible game. 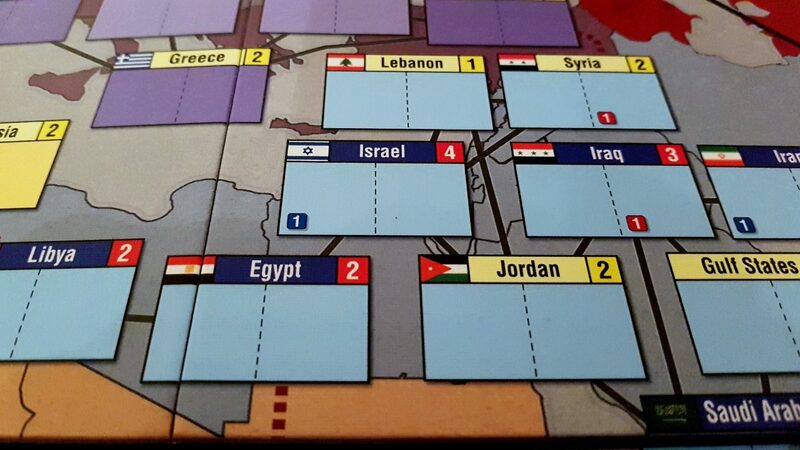 Twilight Struggle is a game of dueling ideologies and it’s an intensely mental, intellectual activity. Aside from the dice rolling, which we’ll get to, it’s purely a game of mind versus mind. Even those aspects of the game that normally add novelty and spice to play (card distribution) must be memorized to enable meaningful strategy. You need to be clever, at least within a specialised intellectual skillset, to play Twilight Struggle well. You can’t get by with luck and a can-do attitude. As such, it shares certain characteristics with Chess and Hive – it’s an abstracted battle of wits, and it’s really only enjoyable when two people of reasonably equal skill face off against each other. If you lose, it’s hard not to think you’ve just been intellectually bested. Emotional accessibility in large part is dependent on how well people can handle that kind of loss. Unlike Hive though, Twilight Struggle is not a game where methodical positioning yields incremental advantage. Much of the game is a slow, gradual accumulation of victory points within a challenging context. However, if you look away from a region long enough you might find an enemy scores it and dramatically alters the balance of power. If you’ve allowed that to happen twice in the same turn (raises a hand) you might find you go from an overwhelming lead to a painful deficit without having mentally prepared yourself for it. Worse, sometimes you’re the one that makes it happen. It can be painful to see that ‘Europe Scoring’ card in your hand and know that you have to play it and you can’t meaningfully change the state of play. You might be the one to play a card and cost yourself ten points, and that can hurt because you didn’t even have a choice. Worse than that, sometimes you could change the state of play but your opponent won’t let you. You capture France, so they coup it. You place influence in Spain, so they place enough to remove your control. Your opponent can often match you scheme for scheme, meaning that all you have accomplished from a turn is to waste your cards on a battle you absolutely had to fight and yet had no chance of winning. The DEFCON brinksmanship at the core of play is another source of frustration and anger. The game forces play of opponent events, and that means sometimes you create the context for an instant loss. For example, the Olympics Games card has an option for your opponent to boycott, which causes the DEFCON level to drop a point. If you play and they boycott and cause a nuclear exchange, you lose even though they triggered the crisis. It’s considered to have happened on your watch, so you’re to blame. Similarly, if you play a card that permits your opponent to play an op card, they can issue a coup that will instantly win them the game. Rarely, but sometimes, it’s your only option. Then on to this we need to add the ongoing structural frustration of dice-rolling for coups, realignments and space track progress. You can spend an expensive card and get nothing out of it, and if the result of that was to give your opponent some powerful advantage it can be galling. Even when it is the obviously strategic optimal play, the dice add so much randomness to events that you may find yourself punished for playing entirely optimally. We’re never keen here at Meeple Like Us on games where the only way you can improve your future performance is ‘roll the dice better’, but that’s sometimes what Twilight Struggles comes down to. That can be infuriating. It’s especially infuriating when the loss of momentum undermines your ability to undo mistakes. Your errors linger for a long time in Twilight Struggle, and when those mistakes are simply down to the dice it can be a constant reminder of how badly fate screwed you. We don’t recommend Twilight Struggle in this category. 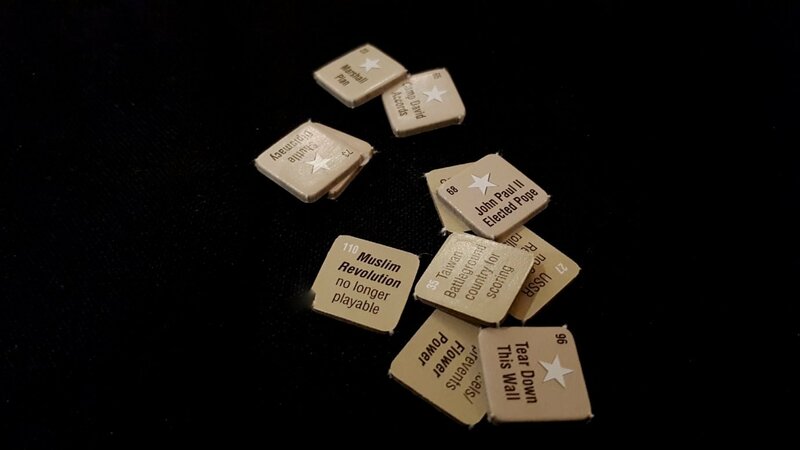 There are a lot of tiny tokens you need to constantly manipulate and flip – you’ll be changing influence markers, cashing them in for larger denominations, and distributing multiple markers across multiple countries in a turn. These are very small, must be reasonably precisely placed, and sprawl over a huge eight fold map. This is an area of stability. FOR NOW. The game has a hand of eight cards you’ll have at any one time, but this can be handled with a standard card holder. There’s a fair degree of shuffling and discarding from the deck, but it’s a shared deck so doesn’t have the same expectation of asynchronous shuffling as you’d find in a deck builder. However, the game lends itself well to verbalisation – every part of the map is uniquely identified, each card has its own description, and the narrative of play can be precisely expressed in all permutations. Spend Nato as an operation card, and spend one influence point in Japan, and the rest in France. As long as you can physically or verbally indicate which card from the card holder is to be used, the game is verbally playable for those with physical impairments of all kinds. As such, we tentatively recommend Twilight Struggle in this category. I don’t have a sound enough grasp of the intricacies of the Cold War to be able to give an intelligent opinion on how well it reflects the divergent viewpoints of the three decades it encompasses. I won’t even try. I will say though that those who would most likely have aligned themselves with the flower power movement will find it a difficult game to make peace with, especially since the flower power movement is seen as a boon for the USSR. I’m sure left and right wing historians would have many more interesting things to say about the way the politics of the time are portrayed. I just find it all fascinating even if I can’t give an intelligent analysis. As you can undoubtedly guess, the game highlights the accomplishments and follies of far more men than it does women, and most of the countries of the game are a footnote. They’re battlegrounds for disinterested ideological imperial powers, not worthy locations in and of themselves. That seems entirely thematic and appropriate to me, given how rigorously the game cleaves to its source material. As with my comments above on the politics of the time, I don’t know enough about the political and military accomplishments of women in the time period to identify meaningful absences. There are some notable events, such as ‘Hanoi Jane’, that could have been incorporated. However, this is a game so abstracted from the real world conflict that ‘Vietnam’ is pretty much a single card event. The lens through which you view this geopolitical conflict is so wide that it’s unsurprising you can’t see much of detail. Is that how a wide lens works? I’m not really a camera guy. In short, what I’m saying is that a meaningful discussion of the socioeconomic accessibility of Twilight Struggle requires a more informed voice than mine. If anyone knows a resource I could link in here, let me know. Even if there were substantial problems with the diversity of representation, this is a game where theme to my mind absolutely excuses them. You couldn’t paste on diversity here without fundamentally altering the game to the point of unrecognizability, and you’d end up with something worse for the effort. 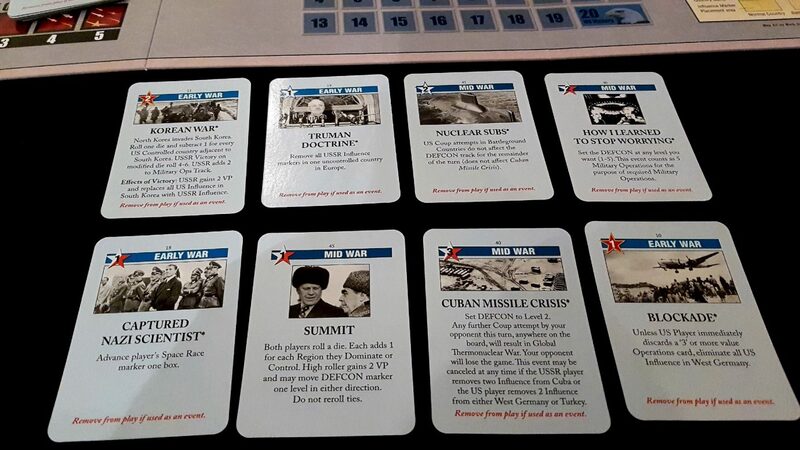 Twilight Struggle is a pricey proposition – the RRP is £45 and it is an unabashedly two player game. You could play it in teams, but it’s very much not designed for that. That’s a high price for something that can’t scale up to any kind of meaningful group play. However, it’s worth thinking of this, like Memoir ’44, as an educational aid as much as a board game. As a crash course in the geopolitics of the Cold War, it’s a bargain. We recommend Twilight Struggle in this category, but that recommendation comes with the caveat that our historical ignorance may be obscuring critical flaws in its portrayal of the subject matter. A considerable degree of literacy is required for play, but no other formal need for communication. Playing it in stoic silence as you eye up the Communist Dogs/American Pigs is probably the best way to play it, in fact. We recommend Twilight Struggle in this category. There aren’t many intersectional categories where we don’t already recommend avoiding the game as a result of one component element. The only real area that would move the game into inaccessiblity for an otherwise recommended category is in the intersection of physical and communicative conditions. If the game is playable through verbalisation, it does mean that the expectation is that the physically impaired player can articulate, and also that the other player can hear. For both of those, the instruction to be followed will be unambiguous, but may also be quite precise. For the rest – yeesh, the play-time is substantial. The box suggests three hours is the upper limit, but I’ve heard plenty of people putting the expected commitment of time closer to four or five hours. If you factor in the need to compensate for accessibility considerations, six hours doesn’t seem like it would be out of the realms of possibility. This is the kind of game you need to plan a day around, and is entirely incompatible with any condition that has modulating levels of distress or discomfort. The intensity of thought and consideration that needs invested too is almost guaranteed to exacerbate this. Twilight Struggle isn’t Monopoly where you may spend hours without thinking an interesting thought about the game. Every round of every turn is full of intricate, deeply meaningful play. It is mentally exhausting, and that’s going to be a contributory factor in many broad intersections of impairment. As a two player game, it doesn’t even permit dropping in or out. Both players are in this for the long term unless one concedes, which is rarely going to be a satisfying conclusion to play. It’s not even as if you can meaningfully declare a winner based on points, because they won’t necessarily reflect the real nuance of momentum. One player may be five points in the lead, but the other player may have dominance in the Middle East and the appropriate scoring card in hand. An abrupt reversal of fortunes may only be a few cards away. It’s probably no great surprise that a game as deep and as historically literate as Twilight Struggle would not offer a great deal of accessibility. Its problems in the cognitive categories are a natural consequence of its subtle, nuanced gameplay. Its problems elsewhere are largely down to the sheer amount of information that interrelates throughout the game systems. However, while we are firmly convinced it’s a game that can’t simultaneously be satisfying and cognitively accessible, it might be worth those to whom other categories pertain have a think about its relevance. Twilight Struggle is easily the highest rated (in terms of the BGG top game rankings) game we’ve looked at – at least, so far. Many people would put it as the best game of all time, and it did indeed spend over five years at the top of the list. It might well be worth the effort to (Twilight) struggle through a compensation regime that permits play. We did mention above that certainly as far as visual accessibility goes, if you want to play you absolutely would be able to – there is so much external information out there that you could cobble together all the data you need in more accessible channels. Maybe it’s worth it? That’s not for me to decide. At four stars though, we’d certainly understand if you wanted to make the effort.